Scoliosis is an abnormal curvature of the spine that an estimated 6-9 million people suffer with in America. While that is distressing enough, coping with scoliosis is compounded by the fact that it most often shows up during childhood growth spurts. This is a time when a child is in a somewhat complicated stage of life, facing physical and emotional changes, peer group acceptance, social challenges, etc. June has been designated as National Scoliosis Awareness Month and is our topic of exploration. 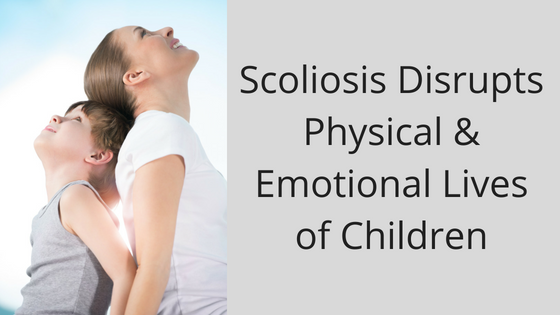 This point cannot be over-emphasized, that with the added diagnosis of scoliosis, unlike some other diseases, parents may also need to deal with fear, anger, and insecurity from children in their formative years. The Mayo Clinic suggests a strong, supportive peer group can have a significant impact on a child’s or teen’s acceptance of scoliosis, bracing or surgical treatment. Encourage your child to talk to his or her friends and ask for their support. You also should investigate support groups for parents & kids with scoliosis. There you will engage with support members who can relay real-life experiences and help you connect with others facing similar challenges. One of the first things to make clear is that there is nothing anyone, child or parent, did wrong. While scoliosis can be caused by conditions such as cerebral palsy and muscular dystrophy, the cause of most scoliosis is unknown. Often administered in elementary schools during physical exams, the Adam’s Forward Bend Test can usually diagnose most forms of scoliosis. While most cases are considered mild, some kids may develop spine deformities which become more severe as they grow. Severe scoliosis can be quite disabling. In fact, an especially severe spinal curve can reduce the amount of space within the chest, making it difficult for the lungs to function properly. The Mayo Clinic suggests that children who have mild scoliosis be monitored closely, usually with X-rays, to make sure the curve is not getting worse. In many cases, no treatment is necessary. But, some children will need to wear a brace to stop the curve from worsening. Others may require surgery to keep the scoliosis from worsening and to straighten severe cases of scoliosis. This advice is echoed by Shriners Hospitals for Children which recommends routine scoliosis screenings for all children and adolescents as early detection is the best way to prevent curve progression. In line with that suggestion of early detection, Shriners is advocating use of an app called SpineScreen. With it parents can quickly and constantly monitor their child’s spine in the comfort of their home. The SpineScreen app detects curves when the phone is moved along a child’s back. While the idea of a “disease of the month” sounds terrible, it is beneficial for just this type of dissemination of information. Did you know about the app? Think of how much more you will know when you do additional reading about scoliosis on the websites of Mayo Clinic or Shriners Hospital for Children, or any number of others, during National Scoliosis Awareness Month. Your children will thank you. This article was written by Anthony Scialis, Content Writer for Customer Engagement Specialist. You can follow Anthony on LinkedIn, Twitter, or find him blogging about social media marketing on WordPress.